Jeb Bush is a nice guy, and in fact a gentleman. He is much like his brother and his father, who are a bit too Liberal for my tastes. Jeb Bush has the Bush legacy, and America has seen two examples of it. Though there is no doubting their patriotism, it’s their staunch Conservatism that is in question. All Conservatism is compassionate. The renaming of Conservatism implied that there was a type that was not compassionate. 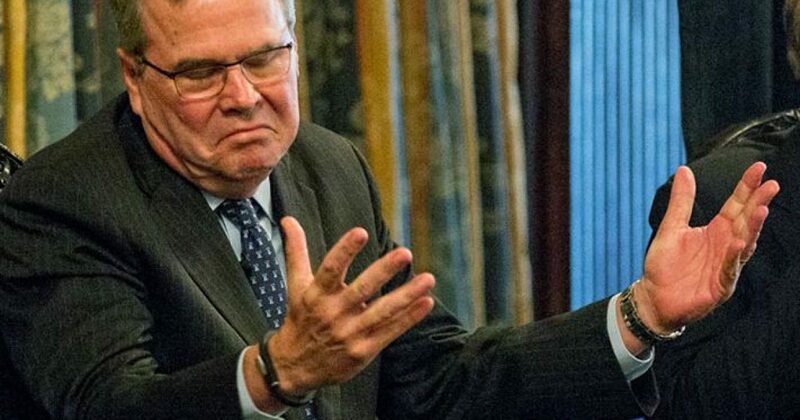 Jeb Bush may very well be his own man, as he often says; however he is a Bush when it comes to his “compassionate” side. It is for this reason he should never be president. The former Florida governor also made a passionate defense of his brother, former President George W. Bush. And that is Jeb Bush’s problem, as he SHOULD blame Barack Obama from DAY ONE! Not only should he blame Barack Obama, he should make it his MISSION to showcase the lies that the Obama administration told while there, even if it’s doing tutorials daily on HBO and SHOWTIME. Bush should have the government take over Jet, Ebony, and Essence magazines, then commandeer BET, LOGO, and the Oprah Winfrey Channel so that he can properly moon all the idiots who voted for Barack Obama. Being president would allow Bush to not only “get even” for his brother, but also get even for CONSERVATIVES! But I guess Jeb is just too “compassionate” for this.